Updated as of June 18, 2013. Due to high demand, I have migrated all the stroller friendly races to an actual Stroller Friendly Race Calendar; whereby, you can search by state (categories) and race distance (tags) to see the races available. Currently, there are more than 1000 races listed throughout the United States and on average, 20-30 races are added a week. Stroller friendly races are hard to find. While many races discourage or outright prohibit the use of jog strollers during the race, I have found several races that offer special start times to strollers, some that encourage all family participation or allow the strollers to start in the back. As of 2012, I began developing a comprehensive list, but I never completed it, so I am trying again this year. Currently, I have a fairly comprehensive list with more than 60 stroller friendly races in the following states; Virginia, Illinois, California (San Diego and working on San Francisco), Colorado, District of Columbia, Georgia, Maryland, Missouri , Nebraska, North Carolina and Texas. Furthermore, you will notice in the Excel document there are worksheets for every state. The Excel document is is alphabetical order by state and each state’s list is organized by date of the race, distance (5K, 10K, 4 miler, 1/2 marathon or other distance) and location. As you probably have found there is no one comprehensive list and/or website to go to that indicates races as stroller friendly. 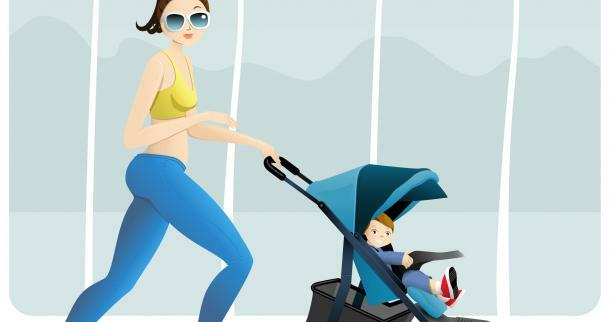 Sites such as Running in the USA, Active.com, or Runner’s World do not have a search filter for “jogging strollers”, so in order to find out if races are jog stroller friendly, you have to contact each individual race director. As you can well imagine this is a daunting task, especially for parents who are trying to plan out their race schedules for the year. Don’t get me wrong, I do plenty of races sans jog stroller – my husband and I switch of race days or get someone to watch our son – but, there are times it is nice to bring him to “race”. As you know, for whatever reason, not all parents have the luxury of having someone else watch their child, so racing without them is not an option. If you know of races that are stroller friendly and you like to add them to the list, please leave a comment below with the Race name, Date, Location, Time and Race distance and preferably the website link as well. I would love if others would begin spreading the word, so we can make a comprehensive list for each state. Updated June 18, 2013. Please note, this will now link you directly to the Stroller Friendly Race Calendar. 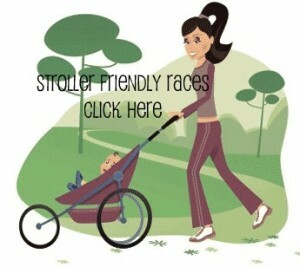 One note: I do encourage anyone racing with a jog stroller to abide by Jog Stroller Racing Etiquette. This is very important not only for the safety of you and your baby, but also for the other runners. Please spread the word about the Stroller Friendly Races List development; the more comprehensive the list the better for all running moms and dads. As race directors confirm that their races are stroller friendly, I will add the race to the list. Thank you in advance for any help you’ve provided. Thank you so much. I will add them to a list for Georgia. I plan on working on Atlanta and Colorado next. I appreciate all the help. Thank you so much for posting the stroller friendly races. This is quite impressive and I’m sure it takes a good bit of time to put together. It is much appreciated. I thought I’d share this bit of information after having contact with the coordinator of the Girls On The Go race(s) set for San Diego on May 11, 2013. They are charging $10 per child-in-stroller. I run with my two girls in a BOB duallie. I have never paid this sort of fee before for a stroller friendly event. I’m interested in finding out if you have come across this fee before while compiling your list. Have a great day and thanks again for sharing! Wow, no I have never run across the fee and they did not mention it. I just sent an inquiry to the race director, so hopefully, I will have an answer soon. That seems like a rather steep price to run with the kids. I will get back to you soon and thank you for sharing the information. So, from what I can conclude the $10 fee is actually for the medal, of course with a bit of an up charge. What a great site, thank you!! I wanted to add the Max Run for a San Diego stroller friendly 5k. It was in September in 2012, the site doesn’t have the 2013 date yet. There was arts and crafts for the kids after the race AND your race bib got you into the Touch a Truck event after the run… Perfect motivation to keep my preschooler in the BOB!! Thanks Andrea! I reached out to Andy and hopefully, he will get back to me with a the date so I can add it to the calendar. I am in the process of trying to migrate all the races listed into the Excel document into the calendar http://laracoffee.com/sports/jog-stroller-friendly-race-calendar/. I will let you know when it is complete. Thank you to directing me to this awesome organization. I just looked at the California races, and both Bay Breeze on 2/16 and NorCal on 2/24 are stroller-friendly for the 1/2 marathon distance. I did both with my baby and had checked with the race directors ahead of time. Thanks, Sam (Bay Breeze) and Ryan (NorCal Half)! Thank you very much. I think we I inquired they mentioned the half is not, but it is good to note that they allowed you to race. I will double check my notes and add the half to my list. By the way, how did you find my site? Have a wonderful day. The race will be chipped and there will be a boot scoot afterward for all ages with some fabulous prizes! A healthy breakfast is catered; it is a very swanky run! Entrance to the Witte museum is free for participants that day with the featured exhibit being dinosaurs! Proceeds go to fund field trips for kiddos to visit the Witte. What a great run/walk with the kiddos! There is also an inMotion training program through New Balance San Antonio. Thank you so much. I have added it to the Stroller Friendly Race Calendar. Here is the Boot Scoot and 5K Run link. If you know of other races that are Stroller friendly, please feel free to submit them. I am in the process of migrating all the information to the actual calendar. Thank you so much for the submission. I have posted it on the Stroller Friendly Race Calendar. Here is the direct link to Abby’s Run for Dandy-Walker Syndrome. If you are planning on running it, would you be willing to write a quick write up on the race and comment on the actual event submission? Have a great day. Anyone know of a stroller-friendly marathon on the East Coast in the fall or early winter? Hi Laura. Thank you for the inquiry. As I mentioned in my email, we will find one for sure. Not aware of any at the moments between the months you are looking for, but we will find one. For those interested, currently we have 15 marathons listed as stroller friendly – 2 being on the east coast – and 36 half marathons that are stroller friendly. Thank you for starting this site! I’ve been looking for races and I know this must be very time consuming. We appreciate your work! Next question, know of any local running clubs for moms in NOVA? I’ve been looking, but none seem to be outside of Alexandria, Arlington, DC area. Hi Nicole. Thank you for the nice compliment on Run Stroller Run, the stroller friendly race calendar. Yes, I can provide you some running groups. Where are you specifically looking for? If you don’t want to post here, you can message me privately at lara@laracoffee.com and I can send it to you directly. Good luck on your race. Hi Nicole. Here are some mom/ladies only running clubs. This list came from Another Mother Runner Running Club List. Here is the Woodbridge chapter of Moms on the Run. Fairfax Four Miler and Crystal City Twilighter are NOT stroller friendly. VA Wine Country Half Marathon in June is. St Patrick’s Day 8K in DC is (and has a kids race). Clarendon Day 10K is (and has a kids’ race). Alexandria Turkey Trot in Virginia is. Shamrock Half Marathon in VA Beach is (don’t know about the marathon or the 10K). Thank you! I did remove these two events from the calendar; Fairfax Four Miler and Crystal City Twilighter are NOT stroller friendly. Thank you, most of these events were on the calendar and the ones that were not, I added them. VA Wine Country Half Marathon in June is. St Patrick’s Day 8K in DC is (and has a kids race). Clarendon Day 10K is (and has a kids’ race). Alexandria Turkey Trot in Virginia is. With regards to the Alexandria Turkey Trot race, nothing is up about the 2013 race at all yet. If you find the information, please let me know. Shamrock Half Marathon and Full Marathon in VA Beach is (don’t know about the marathon or the 10K). Our team has had several people run with strollers in the full marathon and all Shamrock runs in VA Beach are stroller friendly. I’m a VA Beach local. As far as I’ve seen, all of the J&A events, all distances are stroller-friendly. They just ask that you start in the last corral and not impede other runners. In fact, there are several mom running groups that train for the various events – Shamrock Sportsfest, Crawlin’ Crab 5k & Half, Wicked 10k, Surf-n-Santa 10-miler, and the VA is for Lovers 14k. Thank you Anne. I believe I actually have most listed already, but I will add the others to the calendar. Thank you very much for your feedback and additions. Have a wonderful day. Hi, I just found your website and wanted to say Thank You very much for Taking the time to put this list together and making it available to everyone. I have been looking for races especially half marathons that allow strollers and was able to only find 2 near me. I’m so glad i can come to one site for a detatiled list. I will definitely keep checking back on your website for updates. Take care and thanks again. Sandra, you are more than welcome. I am glad you were able to find the calendar helpful. If you know of races that I do not have listed, please let me know so I can add them to the calendar. Have a wonderful day and keep running strong.